There is a legend about the life an Elizabeth of Hungary from the 13th century. I was reading this story to my children this week. The story goes like this. This royal princess in her own right marries another royal at the tender age of 14. While she had grown up as a person of faith, during this time, she is exposed to the teachings of the Franciscans. She is taken by the commitment to caring for those who are ill and feeding the hungry. While her husband, Louis, seems generally quite supportive of living out her faith in these ways, his family, who own the castle and grounds where she lives are not. However, Elizabeth is resolved to live out a faith-filled life trusting God will take care of her. One particular day, Elizabeth takes all of the bread from the castle to feed those who are hungry. She rides her horse to distribute throughout the villages. When suddenly, she comes upon her mother in law, who demands for her to open her cloak and basket expecting to bread squirrelled away. As she opened her cloak and basket, roses poured out. The trust in that moment was ineffable. Elizabeth was silent for days after. God is with us. Emmanuel. In Matthew’s version of the birth narrative, we do not begin with Mary. Rather, the Joseph is the main character of thescene. Joseph has the attention of the reader. In Luke, it is Mary. Here it is Joseph, the dreamer. Having come from Genesis, we remember another Joseph, who was a dreamer. However, this Joseph was up against it. The plan had changed, and he was caught figuring and seeking the gentle way out. Joseph, a man of dignity and righteousness, was seeking kindness and gentleness for Mary. In the tradition, Joseph is considerably older than Mary. What we know about Joseph is that he considers quietly making the scandal as small as possible. Letting Mary off the hook. Joseph would extend his gravitas and respect to cover the scandal. When the most seemingly unusual thing happened, Joseph falls asleep. (Sometimes, these things do just happen). Hopefully, not too often in the middle of sermons. In the center of these eight verses, Joseph sleeps. He sleeps for four verses. For many of us, sleeping seems like giving up and giving in. Sleeping seems passive. Joseph says nothing. Throughout the whole episode, we never hear the voice of Joseph. Through the passage or the biblical witness, we do not ever hear Joseph, at all. No words attributed to him. Only actions. Actions supported and guided by the very words of God. He is a person of few words and meaningful action – resolve and trust – do we know people like? Are we people like this? He does not quietly divorce Mary as he planned. Instead, he walks beside her to Bethlehem, registers their family, assists as he can with the birth of the baby, and begins again swinging the hammer and caring for his family. Then, when the God speaks to Joseph through an angel, Joseph responds as instructed. Quietly, with commitment and trust. Not because it all makes sense, necessarily. But because Joseph is willing to do it with it all making complete sense. Joseph says nothing. God’s way was enough in Joseph’s life. God is with us. Joseph did a lot in his silence. Joseph let go of his fear. Joseph let go of his control. Joseph let go of his illusion that his marriage would go a certain way with Mary. Joseph had a lot of soul work to do in his silence. Work that no one else could do for him. He had to do it for himself. And it was the kind of work that you do after encountering an angel of the Lord. It was the kind of work you often do in silence, in solitude, but that you never seem to feel lonely about. Joseph was building trust and resolve, like you and I might build a bookcase or a set of shelves. 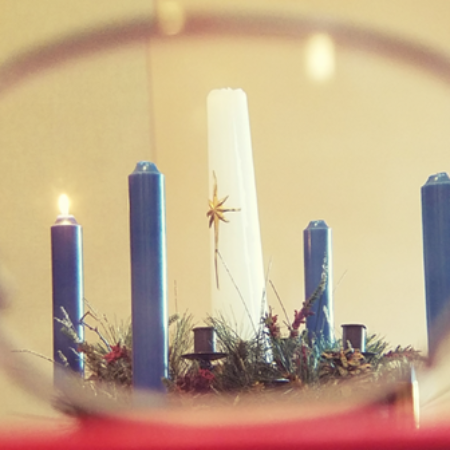 He was making space, in the way that Mary made space for God, Emmanuel, God with us. Here, the psalmist speaks to us. For God alone, my soul waits in silence. My hope is in God. Once God has spoken, the power belongs to God and the love belongs to us. This Joseph knew. God had the power, and Joseph had the love. The love that Joseph offered again and again to Mary and then, to the Christ child. God routinely speaks through our dreams and invites us to trust God’s ways. God is with us. In the messiness of our lives, God is offering us ways to step into partial solutions and possibilities. The reason we sleep is to dream and to allow our bodies to use the swiss army knife of health, as I have now learned. We dream to allow God to speak to us. God appeared to Joseph. And guess what! God appeared to Mary, too! God has been showing up in the dreams and lives of people ever since! Dreamers through the Bible. Dreamers throughout history. Dreamers gathered here this morning! Dreamers who God has been speaking to, have we heard God? When you and I wake up, we, too have some work to do. We empty ourselves of fear and control and illusions. The kind of work that no one else could do for us. We had to do it for ourselves. And it was the kind of work that you and I do after encountering an angel of the Lord. Work that no one else can do for us as we prepare for the coming of the Christ child. When we are still rubbing our eyes, wondering exactly what we have seen? It was the kind of work you often do in silence, in solitude, but that you never seem to feel lonely about. Making space by emptying ourselves until we, too are filled with trust and resolution. This feels like Advent. The getting ready part. The part where we say, sometimes out loud and sometimes with our actions, yes, I choose God’s ways. I choose to trust God and be resolved to follow God’s ways. God is with us. That kind of trust is a gift. May this gift that was Joseph’s be yours this Advent season. Sunday: “For God alone my soul waits in silence; from him comes my salvation.” Psalm 62: 1. Prayerfully consider God’s ways. Monday: “Trust in him at all times, O people; pour out your heart before him; God is a refuge for us.” Psalm 62: 8. Where do you need to trust in God by pouring out your heart? Tuesday: “Once God has spoken; twice have I heard this: that power belongs to God,” Psalm 62: 11. Where do you hear God’s voice and see God’s power? Wednesday: “Her husband Joseph, being a righteous man and unwilling to expose her to public disgrace, planned to dismiss her quietly.” Matthew 1: 19. Joseph begins in our story as a person of integrity. His life has been lives in righteousness and dignity. Prayerfully seek to live in integrity and dignity. Thursday: “But just when he had resolved to do this, an angel of the Lord appeared to him in a dream and said, ‘Joseph, son of David, do not be afraid to take Mary as your wife, for the child conceived in her is from the Holy Spirit. She will bear a son, and you are to name him Jesus, for he will save his people from their sins.’” Matthew 1: 20-21. God has a way of redirecting our good intentions. Make a time of quietude to hear. Friday: “All this took place to fulfil what had been spoken by the Lord through the prophet: which means, ‘God is with us.’ “Matthew 1: 22- 23. God speaks through those around us. Who is God speaking through today? Saturday: “When Joseph awoke from sleep, he did as the angel of the Lord commanded him; he took her as his wife, but had no marital relations with her until she had borne a son; and he named him Jesus.” Matthew 1: 24-25. Even in dreams, God can sometimes speak to us. Where do you need to prayerfully listen for the voice of God?